As a young man, still mastering the arts of sculpture and goldsmithing, Stephen opened a gallery in Denver, Colorado, Santa Fe, New Mexico, and then Scottsdale, Arizona, and for 20 years enthusiastically pursued a career as an art dealer specializing in one of his passions: 19th & 20th century American Art. By 1993, Stephen had sold almost thirty million dollars of art, negotiated the sale, transfer or gift of 6,000 items, arranged eight auctions, and was a recognized authority on American Art from the period 1850 - 1950. authority on American Art from the period 1850 - 1950. During this time Stephen also sold his own silver art pieces, jewelry and sculpture in the gallery, hallmarked with the name "O'Meara Sterling." Stephen moved the "O'Meara Gallery" to Scottsdale, Arizona, in 1988, and became a private dealer in 1993 in order to pursue a lifelong dream to fly commercially. Stephen has been a licensed pilot since the age of 15, and is a licensed flight instructor. 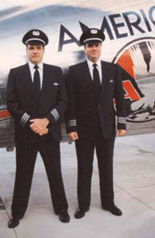 At the age of 39 he obtained a degree in Aeronautics from Embry Riddle University, and enjoyed 7 years flying the Embraer 145 for the regional division of American Airlines. Stephen is a qualified pilot in command on the Boeing 747 airliner, Cessna Citation Jet and Lear Jet. Although engrossed in aviation, Stephen’s artistic career was also flourishing at this time. He started producing "The Legacy Collection" - a series of 1/12th scale object d'art replicating famous antique silver and gold from Europe and America, honoring the legacy created by silversmiths of the past. The series, which includes over 300 handcrafted items in solid silver and gold, was so successful that several important pieces were purchased by American museums, received national and international press, and are still purchased today by collectors worldwide. Every piece is hallmarked "O'Meara Sterling."